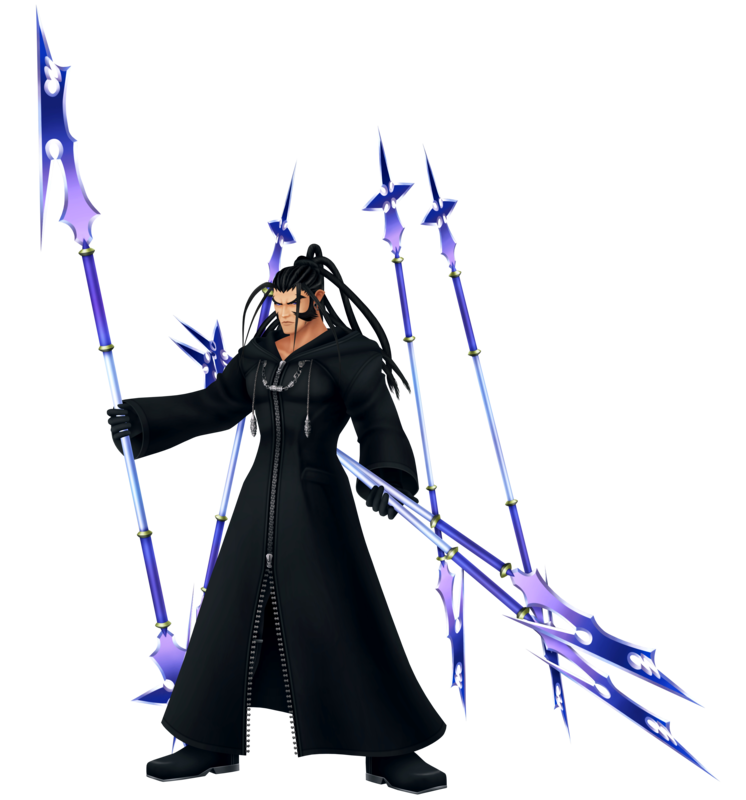 As Number III, Xaldin is a founding member of Organization XIII and a very prominent member within its ranks; while not in the league of Xemnas or his second-in-command Saïx, Xaldin holds his own with his fierce independence and his love for causing others despair, a sadistic attribute that he carries. His cruelty reaches its apex in the realm of Beast, a tormented man-turned-beast whose pain is perfect for Xaldin's brutal projections; his goal is to capture Beast's heart and to turn him into a gigantic Heartless, unthinking and unstoppable. Xaldin débuts in the Final Mix as a superior member to Axel, whose goal is to drag Roxas back to the Organization or kill him, an order put into place by Xemnas as a result of Roxas' escape due to the events of Kingdom Hearts 358/2 Days. The first time Axel fails to detain him is one time too many for Xaldin and others within the Thirteenth Order, and he threatens to turn Axel into a Dusk if he doesn't do his mission right the second time. Xaldin's next appearance is in Hollow Bastion with the rest of the remaining members of the Organization; unlike Xemnas and his jocular Organization mate Xigbar, Xaldin makes no extra jibe at Sora and friends, and only joins in with the rest of his ilk in laughing along with Xemnas' empty humor. Not long after his second appearance, Xaldin pops up again not longer after Sora awakens; due to his investigations in 358/2 Days on the nature of Beast, his rose - Beast's key to reverting back to his original human self - and his belle, Belle, Xaldin is stationed at Beast's Castle. Having already rooted his cruel words of hopelessness and Belle's ‘treason' deep into Beast's mind, Sora enters into the flood of anger that permeates the cold, vacant atmosphere at the castle and is resultantly confronted by Beast, exacerbated by Xaldin's poisonous lies about Sora being in alliance with the plotting Belle. After Beast comes around to his senses and teams up with Sora, Xaldin sets a giant object-infecting Heartless on the ballroom to destroy both Beast and Sora. Once it fails, Xaldin goes back into the shadows of the world with more schemes up his sleeve for Sora's next visit. On that next visit Xaldin decides to turn the heat up and personally intervenes with the series of events. He does away with the magic rose that holds the key to Beast's humanity, an act that makes the intense anger within Beast rage like wildfire - and to make matters worse, Xaldin lays his entire agenda out before everyone and discloses his ambitions of taking Beast's heart and having control over the resultant Heartless and Nobody, two beings of extreme potential. After Xaldin slips away, having gotten his fingers dirty, he lies in wait while his plans follow through of their own accord; Beast's fury at Belle orders his demand that she leave. Once this is in effect Xaldin slides back in and leaves the rose on Belle's balcony as bait; and when she falls for it Xaldin kidnaps her and the rose to use as an ultimatum against Beast: the rose or Belle's life. But Belle has guts, too, and Xaldin is elbowed in the stomach before she takes the chance to escape. This spells only one thing for Xaldin: battle. He is now cornered by Sora and Beast, two very angry individuals who would like nothing more than to see Xaldin's dreadlocks rolling in the wind along with his head. Xaldin, cruel but not a fool, puts his game face on and almost thrashes the both of them with his wind attribute and his six sharp lances, Lindworm, before they get the best of him and sending him flying back into the realm of death. 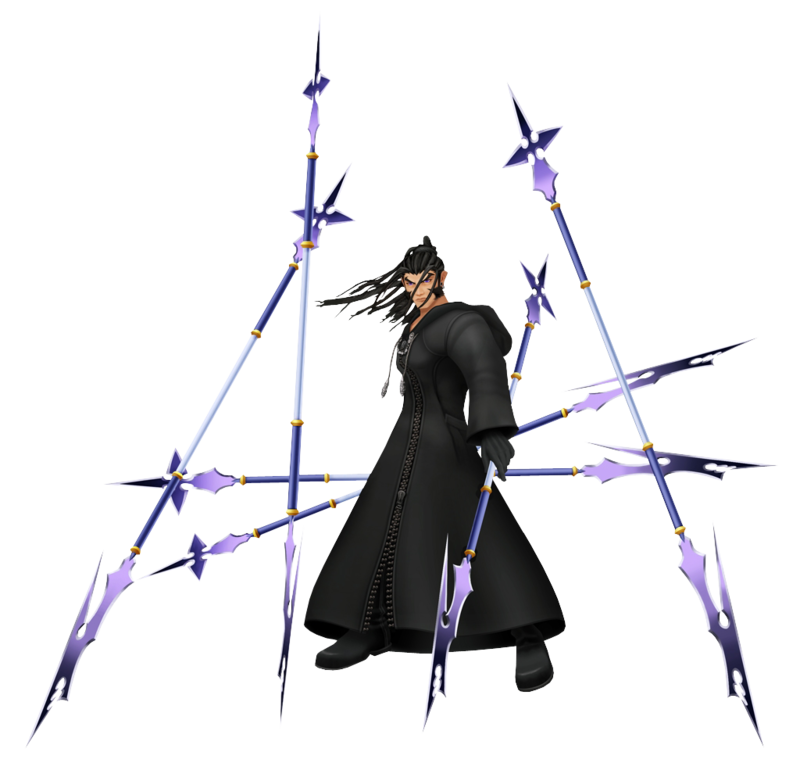 A fearless and independent member of Organization XIII, Xaldin is one of the more highly respected members of Organization XIII, having the most mission success as shown by the position of his throne which is second to Xemnas'. He is the Whirlwind Lancer, truly a master of the wind and - despite his broad build - he is surprisingly quite acrobatic in combat, making him one of the tougher members of the Organization. Outside of combat, he works alone and is seen to be quite cruel and sadistic in nature, often revelling in despair and playing on the psychological factors of his victims. When not alone, however, he is ordered by Saïx to assist the newcomer Roxas on some of his missions. It is on one of these missions that the pair goes to Beast's Castle, where Xaldin encounters the Beast's awesome power. This attracts Xaldin, who then spends most of his mission time at the Beast's home, learning about the Castle and its inhabitants. This sparks off Xaldin's task of retrieving the Beast's heart and making a Heartless and Nobody of him. It is at the Beast's Castle after Roxas leaves the Organization that Xaldin meets his end at the hands of Sora. On the field, Xaldin is quite light and dexterous, which on one hand is surprising considering he is rather bulky; on the other hand, it is to be expected of him given his nature as a master of the wind. At his disposal are six lances, Lindworm, each as sharp and deadly at the next, with which he can cause considerable damage due to their jabbing attacks and sweeping assaults. During his Limit Break, Dragoon Storm, he only becomes more deadly with the employment of his wind element, summoning all of his lances around himself in a fiercely offence shield and razing everything in sight. He delivers fatal attacks to his enemy using his Jump technique during which he jumps into the air and crashes into his opponent with the power of a meteor.